This neon sign is red, blue, and green, with a small hint of yellow in the arrow. 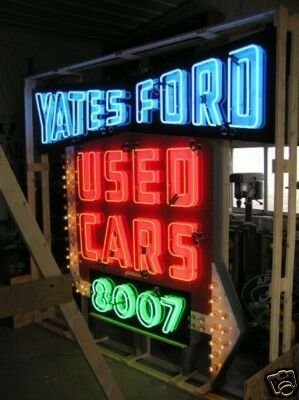 The text on the Yates Ford Used Cars Neon sign reads “Yates Ford, Used Cars, 8007.” There is an arrow running from the word “Yates” down to the bottom of the sign as it points to the right. These signs are not seen often.